1) Me tornei oficialmente Research Fellow do CTG. Que honra!!! Que privilégio!! 2) Hoje está ocorrendo o lançamento da publicação TIC Governo Eletrônico 2015 com um artigo que tive o privilégio de escrever com o Dr. Gil-Garcia, meu co-orientador do Doutorado nos EUA. Este evento é do Comitê Gestor da Internet no Brasil (CGI.br), desenvolvida pelo Centro Regional de Estudos para o Desenvolvimento da Sociedade da Informação (Cetic.br) do Núcleo de Informação e Coordenação do Ponto BR (NIC.br). 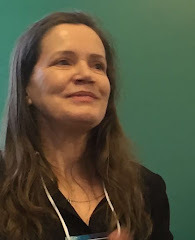 Dr. Bea Lanza, a former CTG Visiting Scholar (2014-2015), is a Researcher at the Federal University of the state of Paraná and Pontifical and at the Catholic University of Paraná in Brazil. Additionally, since 2001, Bea has been a senior analist at Celepar - ICT Company of Paraná Government. Bea has degree in Economics and also a Masters degree in International Business Administration in Electronic Government and in Systems Analysis. She took part in e-PING (Brazilian Government Interoperability Standard) and coordinated the Electronic Government Department of the Paraná Government. In 2006, she received the CONIP Excellence Award for Corporate Use of SMS (Short Message Service) in the Paraná State. In Vienna, she was a Best Paper Finalist and received a Highly Commended Paper Award for her article "Relations Among Governmental Project Actor: The Case of Paraná mGov." Bea's dissertation, defended in August of 2016, was entitled "Business Model for SMS-Based Government Services: an Analysis from Configuration Theory." LANZA, B. B. B.; GIL-GARCIA, J. RAMON; COSTELLO, J.; WERTHMULLER, D. Mobile Government Readiness: Proposing a Multidimensional Framework and an Assessment Tool. In: 15th IFIP Electronic Government (EGOV) and 8th Electronic Participation (ePart) Conference 2016 and Electronic Government and Electronic Participation: Joint Proceedings of Ongoing Research, PhD Papers, Posters and Workshops of IFIP EGOV and EPart 2015. Washington: IOS Press, 2016. v. 23. p. 61-68. LANZA, B. B. B.; GIL-GARCIA, J. RAMON; GIMENEZ, F. A. P. Towards a Business Model for SMS-Based Government Services. In: Electronic Government and Electronic Participation, 2015, Thessaloniki. Electronic Government and Electronic Participation: Joint Proceedings of Ongoing Research, PhD Papers, Posters and Workshops of IFIP EGOV and EPart 2015. Amsterdã: IOS Press, 2015. v. 22. p. 269. LANZA, B. Dinâmica de relacionamento entre atores de projetos governamentais. . 1. ed. Saarbrücken: Novas Edições Acadêmicas, 2015. v. 1. 152p..
LANZA, B. B. B.; CUNHA, M. A.Relations among Actors in Governmental Projects..International Journal of E-Services and Mobile Applications,v. 5, p. 25-42, 2013.